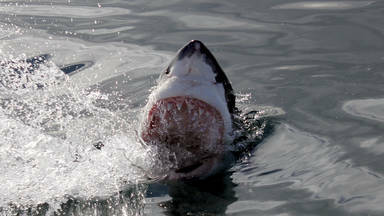 Marine Dynamics is a company, which specialises in Great White Shark diving excursions. Wilfred Chivell, a pioneer in marine conservation, bought Marine Dynamics Tours in 2005 and turned it into a private company, following the success of Dyer Island Cruises – the first whale watching business in the Dyer Island region - which he started in 2000. Both Marine Dynamics and Dyer Island Cruises are BEE Level 1 companies and boast Fair Trade in Tourism certification and are heavily involved in a number of marine research, conservation and education projects related to the Great White Shark, whales, seals, dolphins, penguins and other marine bird species. The Dyer Island Conservation Trust was established in 2006 to manage these and other projects. We feel that the White Shark and its environment have to be protected as a whole. We offer return transfers to and from Cape Town, Hermanus and Grabouw. 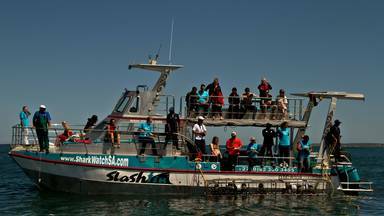 Slashfin easily accommodates 44 passengers and can be booked for private charters as well. GPS: -34º 36' 53.74", +19º 21' 10.75"